Karwa Chauth: How B-town celebrates the festival of love? Karwa chauth is an important festival for married women in India. Because of Bollywood movies, karwa chauth has become a big phenomenon in India. The festival has been portrayed in many movies. Bollywood has given the ladies higher goals for Karwa Chauth. Karwa chauth is an important festival for married women in India, who observe fast for safety and long life of their husbands. Thanks to the Bollywood movies, karwa chauth has become a big phenomenon in India. The festival was portrayed in movies such as Dilwale Dulhaniya Le Jayenge, Kabhi Khushi Kabhi Gham, Baghban and Hum Dil De Chuke Sanam which have made a huge impact on the viewers. Here's how Bollywood stars celebrate karwa chauth, a festival of love. 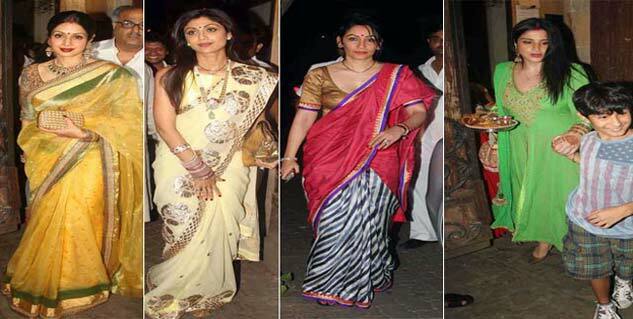 Shilpa Shetty has her family roots in South India where Karwa chauth is not a notable festival. Since she is married to a Punjabi, Shilpa follows the tradition of Karwa Chauth although she does not like the idea of fasting. Know the right way of fasting. In 2014, Aishwarya Rai observed the pious one-day festival in a traditional way. Despite husband Abhishek being out on a movie shoot, she observed fast and used Skype to perform the rituals. Sonali Bendre’s idea of celebrating karwa chauth is to show her gratitude towards her family. She follows the traditions of the festival as her mother-in-law deeply believes in it. Know all health benefits of fasting. Hema Malini has been celebrating karva chauth for many years. For last few years, her daughter Esha has been observing fast on karva chauth and it’s a grand celebration.